Bringing you better food through technology. The dark side of scientific progress. On May 13 the Supreme Court decided in favor of the copyright of Monsanto in the case discussed below. The decision will have vast implications for American farmers regarding the cost and safety of what we consume as food. A link to a report on that finding will be found at the end of this insightful report from a small time American farmer. Nobody who has not already picked a side in the gmo debate, (or is “GE,” or “chimeric artificial plasmids,” or some other term, preferred, and if so, by which side?) is actually participating in that debate; so I’ll stipulate at the outset that I’m pretty much a hard-core organic traditionalist, who upon hearing about gmo, reacted with something like, “Sounds really bad, agriculturally, nutritionally, and karmically.” (Chimeric—containing characteristics from two or more different organisms. Artificial—human made. The definite article points to the singular, and in this context, we all know the single most important player to be Monsanto, and its billionaire former CEO, Andrew Shapiro, an old white guy in a hurry, on his way to monopolizing the global crop-seed business, thanks to recent trade treaties and court decisions, which can effectively prohibit farmers’ saving their own seeds. As I write this there’s a case about these very considerations, already heard by and awaiting decision, from the Supreme Court. 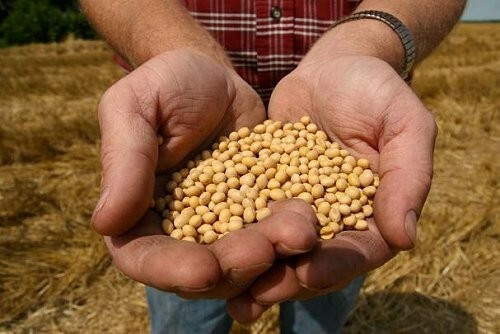 It involves Indiana Farmer Vernon Hugh Bowman, who some years ago took a chance by late-planting a catch crop (maybe they’d ripen a crop in what was left of the growing season, maybe not) of soybeans. Not wishing to spend the big bucks for those proprietary Roundup Ready seeds, he just bought and planted what the local elevator had on hand. Of course farmers know that leguminous flowers are set up to self-pollinate; and so Bowman did use Roundup on that crop, expecting, correctly, that the elevator soybeans would be herbicide-tolerant, because that’s what everyone around there was planting, so that the tolerance trait was all-but-absolutely certain to be expressed in those elevator soybeans. Well, he was taking some kind of advantage of Monsanto’s patented chimeric artificial plasmids, but, really, there has to be some kind of limit on the power of intellectual properties like copyrights’n’patents’n’trademarks, or they’ll just become institutional properties, rentals, so to speak, with no upkeep costs, as opposed to the incentives for innovation that are the rationale for their existence. Historically, this limit has been temporal, and these magic beans with their magic genes were first commercialized in 1996, coincidentally seventeen years ago, which I understand to be the original traditional length of patent protection. So one might well ask where the end of it will be. “Either on the 12th of Never or when Perdition next experiences an ice storm, whichever comes first,” is the answer currently favored by America’s ruling elites. Bowman continued to plant elevator beans as his second crop, and probably understood that he was skirting contract rules, otherwise he’d have combined and planted his own. (I’m guessing elevator operators also had a clue this was going on, and I’d be surprised if they didn’t also sign some contract. Do they bear no responsibility?) When we understand that Monsanto sold about $1.7 Billion worth of soybean seed last year, returning $1.16 Billion in profit, thus selling it for than more three times cost, we recognize that their R&D expenses in developing this technology have long since been covered, many times over. As a farmer myself, I would not use glyphosate, or plant any Roundup Ready seeds, because I presume they’re not safe to use, eat, or feed. (A possible alternative to chemical herbicides might be well-timed, precisely-aimed mechanical cultivation.) But now that this chimeric artificial plasmid’s been planted on hundreds of millions of acres in billions of crop-acre-years, it’s become part of the planet’s soybean genome, and I can’t see why people shouldn’t be able to use it, and to breed it in, or, hopefully, out, particularly in the wake of numerous years of patent protection. If it’s perfectly safe to eat or feed, why does it suddenly become dangerous in the hands of the world’s small-time agricultural operators? Of course the answer is that the real danger would be to the profits of a certain corporate conglomerate. The most famous court case involving gmo’s is doubtless that of Percy Schmeiser of Saskachewan, who, though left stuck with hundreds of thousands in legal bills, actually won his case vs. Monsanto in the Canadian Supreme Court, (hats off to ‘em) establishing the company’s responsibility for contaminating his fields with their GM canola. Why do so many of us, including myself until I did some fact-checking, think he ended up prohibited from replanting his own non-gm canola? Danger to the profits of a certain corporate conglomerate, anyone; or did I only hear the result of a lower court ruling? Since I’m writing this in the role of a literature molecular biologist, let’s do a thought experiment, one that puts the shoe of cultural and political power on the other foot. In this hypothetical, instead of being greed-heads, Monsanto and its friends are just, you know, heads, so the genes-of-interest they bred in produced Cocaine or Mescaline or Tryptamine. See if you think American regulatory authorities would then embrace this technology with the kind of love-at-first-sight enthusiasm that now prevails. No, they’d likely be criminalized, along with the technology that spawned them. Criminalization would also be wrong and unfortunate. I’m convinced this technology has great potential for advances in economics and knowledge and industry and medicine. But it really should not be used for food or feed; and the notion implicit in this thought experiment, that adding chimeric plasmids, even in the noble cause of a buzz, will be otherwise entirely benign, is an apparent impossibility. Furthermore, these industrial crops will need some kind of environmental containment—buffer zones and composting of crop residues should suffice. Once these investigators understand that they have to move on to industrial stuff only, they should be able to make more rapid progress in this appropriate area. I’d suggest latex-bearing plants, hopefully ones that never set seed and thus avoid the potential hazard of gmo-laden pollen. Or cultivated diatoms, which both make substantial amounts of petroleum-like compounds, and could possibly be grown with lesser water resources as well. And with a lot less controversy. The reason I’m advocating composting for gmo industrial crop residues relates to the central new idea in this piece, because the natural soil-borne microflora that are the denizens of fermenting heaps contain a vast array of enzymes that break down natural macromolecules in general. And nucleic acids in particular, which turns out to mean that compost piles can digest the circular DNA molecules that are the chimeric artificial plasmids of gmo technology, if only because time and temperature and the vast array of chemical and biochemical processes that take place in those piles, would almost certainly break all these novel DNA’s down to an inactive size. If that was true, circular DNA’s, which have no ends, could not be digested at all. I was wrong, and probably pretty foolish, to think so, and to think I’d discovered something in finding it out, because I found out something that actually did not exist. So I hereby apologize for saying so publicly--and for thinking no one else would notice something as clear-cut as, “Hey, babe, don’cha know, ain’t no endonucleases in pancreatic see-cretion.” Because of course it runs counter to the way biology works, not to have endogenous digestive capability for nucleic acid, or any part of any food that can be broken down in any way that leads to net energy, so the surprise of it might explain the faux eureka moment. But my mistake, which I’m pleased to say I noted before anyone called me on it, did raise questions about the totality of digestion in actual in vivo situations, and about the marginal digestibility, or not, of circular DNA, in which I would now expect “marginal” to be the key word. Generally, digestion can break cell walls, intracellular membranes, and the small, middleweight, and macro molecules contained in them, into available nutrition and/or waste. But not all of it/them are entirely broken-down. Historically, that’s never been a problem, but with the advent of chimeric artificial plasmids, it can easily give rise to fragments, that accumulating evidence suggests actually can be biologically active, due to their aggressive promiscuity in invading handy genomes of various kinds. Well, I must say I pooh-poohed this possibility when I first heard about it, since it violates many things that I thought I “knew” about biological systems. (It’s kind of analogous to what, at a certain moment, I thought I knew about an absence of endonucleases in pancreatic secretion.) A DNA fragment would have to travel through both a cellular membrane and a nuclear one to begin true biological activity in the sense I’m trying to convey here. That is to say they’re in the host genome, and being expressed through the host’s transcription/translation machinery. But the thing is, these chimeric artificial plasmids all also carry activation factors, ones that allowed them to get into, and be expressed by, target genomes in the first place. After being copied in their billions and their hundreds of billions, I’d suggest they’re likely to get better, qualitatively better, at making the intergenomic leaps that they were cleverly and judiciously designed to make. The remaining question is about the wisdom of that design, because there is such a thing in nature as what I once called The Rhubarb Effect, named after the tendency of seed-grown rhubarb plants to throw seed stalks at an unmistakably smaller size than divisions do. I could also have called it The Lilac Effect, after the way lilacs sucker like crazy! when root pieces are planted. I like Rhubarb better, if only because Lilac is kind of a nothing color; but on reflection, I think either or both are poor terminology choices. References to effects with colors in their names imply something astronomical, e.g. Red Shift. Did I also see it in action, out in the woods, when I noticed a seemingly-dead fir tree that had fallen where at least one obviously-newly-cloned copy of itself seemed to be growing from every bud in contact with the ground? (How ‘bout the very elemental possibility that a first shoot, or root, or living crown, excretes a functional pheromone that tells other possibly bud-capable cells, “Good pickins’ both side of the trail!” The process going on here is called, “layering,” which generally requires some kind of cut on a normally-above-ground plant part getting into soil. Fir trees are particularly hard at spots where branches meet trunks, the brittle bit gets a smack and a new individual is free to grow, presumably out of the cracked spot. Similarly, some ruptured nuclear membranes could unleash particularly aggressively promiscuous plasmids that then go on to invade genomes of various sorts.) These days, there’s talk going around in scientific circles about an “RNA world,” that, at least in informed speculation, preceded the very first, presumably some sort of photosynthetic bacterial, life form. This notion is also consistent with the rsr principle, this time on a middleweight molecular level, as with di, tri, and tetra ribonucleotides, and their documented ability to self-replicate, self-extend, and mediate biochemical processes. (I know I’m right about this one, google search went three million, nine hundred twenty thousand.) So here we have rsr going on at both the human-scale level of common garden plants, and the middleweight molecule level of the “RNA world.” Why would it not also apply at the clearly smaller than the former, larger than the latter, macromolecular level? Right or wrong about endonuclease activity--and allow me, once again, to apologize for being wrong, because in doing so I was construably dissing people more knowledgeable than myself for missing it-- what’s beyond dispute is, that when, during digestive processes, nuclear membranes are ruptured, whole DNA molecules are, at least momentarily, unleashed. Even if only one in a hundred, one in a thousand, remain intact, or intact enough to become biologically active, there’s a substantial risk that one or more of them will go like…rogue, and invade some handy genome, with untoward biological consequences of many possible kinds, such as expression of the “genes of interest,” activation/deactivation of various parts of the new “host” genome, and possible previously unknown peptides, results of a phenomenon known as, “open reading frames,” one of several little-studied, potentially consequential, aspects of gmo technology. In addition to “open reading frames,” there are “sticky ends,” Ti-plasmids, the 35S fraction from CaMV(Cauliflower Mosaic Virus), with its fully(?) included Gene VI region, and on and on. Explaining each, any, or all of these in detail, is less useful than seeing them as parts of a money-making plan that repeatedly takes advantage of the rsr principle in bringing these chimeric artificial plasmids to market; and then turns a blind eye to it, in fact gets into denial about it, when the unwanted, unanticipated progeny of those plasmids run beyond control. Similarly to malignancies, when they go metastatic, possibly being started by one cancer cell, or only a single male gamete actually fertilizing an egg cell, one rogue or runaway plasmid likely could invade a variety of handy genomes. Predicting which, if any, genomes will be invaded, is as impossible as predicting which sperm cell will happen to catch the egg, because it’s all a matter of mindless, more or less individualized, molecular affinities and proximities, much like the sites of new malignancies in metastatic cancer can’t be predicted, although certain types are known to preferentially attach to certain other non-origin tissues. Monsanto’s Andrew Shapiro, who’s recently moved on to start a new venture, specializing in a new generation of chimeric artificial plasmids that will carry multiple “genes of interest,”—talk about pump up the crazy!--is fond of talking about Monsanto’s Law, in which the volume, at least, of biological information, increases geometrically until…Perhaps until there’s a complete global monopoly in the seed business. What’s really going on is the law of unintended consequences. The intention was to have a win/win situation, in which farmers obtained a yield improvement that more than justified the premium price of their improved seed, of crops whose nutritional quality, if not actually improved, was at least unaffected by the added expressed genetic material. Furthermore, another law, that of, “Recapitulation Self Reinforcement,” which both the Company and its contributing investigators knew about, and repeatedly took advantage of in developing their proprietary seeds, was subsequently ignored, with results that are already untoward, and seem more and more likely to become disastrous. People knowledgeable enough to develop these chimeric plasmids, certainly would also know that it’s not reasonable to expect those plasmids to effect their gmo products only in the desired way--as if organisms were machines, in which an old part is replaced with a new one, and it works like new! But biological systems really don’t work that way. In Roundup Ready plants, for example, the added “gene of interest” allows plants at least to make aromatic amino acids sufficient for survival, even though the normal enzymatic pathway is blocked by Glyphosate. Now the seed purveyors want to claim that its only effect is the one they wanted; so when lower trace-mineral content, or trypsin inhibition that leads to gut inflammation, or apparent runaway plasmids show up, everything becomes about denial..
As for the volume of biological information, there can also be a diminishing returns problem going on, as the limitations on what we can learn just by sequencing become clearer with the passage of time, even though understanding those limitations also adds to knowledge volume. The reason we don’t call the subject at hand “Biochemistry,” any more, is typified by, but not limited to, the fact that although The Human Genome, and that of Arabidopsis, and that of the Cauliflower Mosaic Virus, have all been fully DNA-sequenced, as have those of more than two hundred other organisms, the entirety of their cellular functions is very far from being fully understood. Maybe the problem really comes down to money, and to the fact that, if not for a system, in which institutional entities can feel called upon to act like money-making-addicted psychopaths, a big chemical company, upon learning about the problematic potential of runaway plasmids, would be like, “Right, we’ll take the stuff outta food and feed, and make sure the nucleic acid residues from the industrial crops, which will be our future focus, are appropriately broken-down before being looped back to the land. Of course we”ll need to be indemnified regarding the messes we’ve unfortunately already made,” perhaps reorganizing in some sort of public utility form. This would be an ideal solution, one which might actually be implemented in a context of anti-trust prosecution, Ricoh indictments, and effective criminal fines, that eventually leave this industry in the hands of public-spirited receivers, ones who will continue to support the art of cutting-edge research in molecular biology. Supreme Court Decides for Monsanto. 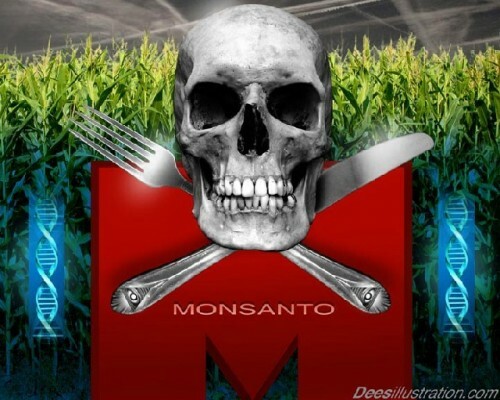 "Monsanto spent $6 million on lobbying last year, and their payoff was the \"Monsanto Protection Act,\" which was written anonymously, passed in secret, and allows Monsanto to keep selling genetically engineered seeds (GMOs) even if a federal court says they may pose a health risk.\r\n\r\nSenator Jeff Merkeley (D-OR) is leading the fight to repeal the \"Monsanto Protection Act\" this week - and the Senate needs to hear how strongly we support him.\r\n\r\nTell the Senate to Repeal the Monsanto Protection Act.\r\n\r\nThanks for all you do!\r\n\r\nBob Fertik"